Uh… we knew there was interest in Xobni for Gmail, Android and iPhone, but we had no idea that we’d hit over 30K requests in a matter of hours. Thanks to our loyal alpha testers, community/forum friends, current users, patient fans and blogger/media friends, word of our coming products got out quick. We’re sending out the invites just as fast as we can and are stoked to have so many ready and willing testers to help us get the product ready for prime time. Xobni for Gmail, Android & iPhone coming soon! – Testers wanted. Not a day goes by at Xobni, without hearing “When will Xobni work on Gmail, Android or iPhone?”. This is truly the #1 request from Xobni users, and we’ve been listening. Last week, we deployed a new service called Xobni Pro. This service includes the robust “Xobni Cloud” architecture, which enables us to develop new products faster. More importantly, it connects Xobni’s relationship management service across multiple platforms and devices. Previously, Xobni users could only unite their Xobni Contacts and rich profiles across Outlook and BlackBerry. Now, with the Xobni Cloud, we can extend this further. The Xobni Cloud is the foundation that will enable us to support new products and platforms going forward. 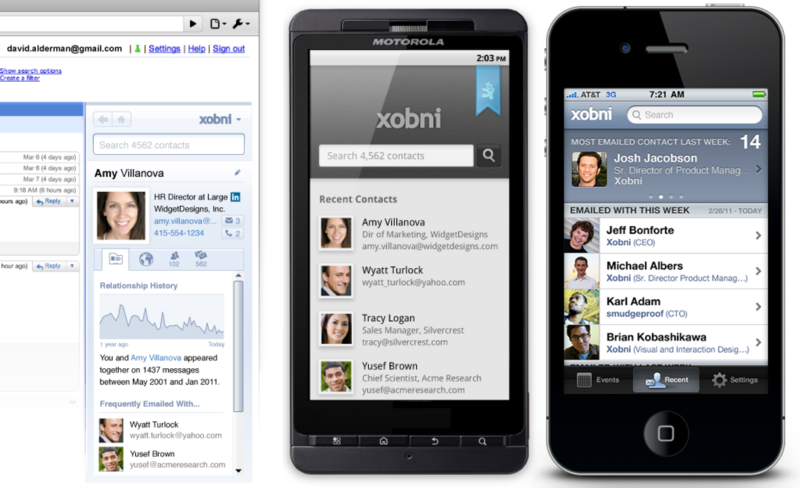 Today we’re announcing that Xobni is coming to Gmail, Android and iPhone. Xobni for Gmail BETA – The Xobni sidebar comes to Gmail! Sign up for the Gmail BETA. Xobni for Android & iPhone ALPHA – The Xobni app on your Android and iPhone providing quick access to your Xobni contacts and information. Sign up for the Android ALPHA or sign up for the iPhone ALPHA. Over the past few months, we have been in Private Alpha mode with Xobni for Gmail with some of the most amazing Alpha testers in the world! This loyal team of testers has been invaluable: diligently identifying bugs, suggesting new features, and providing lots of encouragement along the way during our ALPHA. Thanks so much to each of you for your emails and posts in the forums—your participation makes a difference! So, if you’re one of those really early adopters, and like to get an early peek at these products, or if you’re one of the thousands that has written us asking for Xobni in Gmail, iPhone and Android—we’d love to have you on our Alpha (or Beta) tester team. Sign up on the respective pages for Gmail BETA, Android ALPHA and iPhone ALPHA products. We’ll be letting users in on a first come, first served basis. All feedback, thoughts and ideas are welcomed. You might be wondering: will there be a Free and Pro version of these products? The answer is: Yes! We aren’t sharing all those details yet, but we will in time. We hope you’re as excited as we are, and we are looking forward to developing these products with you by our side.